Webroot has been recognized for their antispyware software for years. The company has leveraged their anti-malware technology to develop a fully functional internet security software with antivirus protection. The software released this week, has already received extremely high rankings because of new technologies offered. The first development is the use of a sort of phishing / download blacklist protection. Rather than developing a separate toolbar to complement the antivirus protection (AVG link scanner), webroot has created a built-in in phishing detection system that scans all web sites within the antivirus program. If Webroot detects â€œany programâ€ (not just the web browser) attempting to connect to a malware site from its constantly updating database, all traffic is instantly blocked. Webroot also has a file shield that scans after the file is downloaded. However, I would prefer a system to scan the file even before it is completely downloaded (E scans Winsock scanning capability). Webroot Internet Security 2011 also includes another protection shield called the execution shield which protects against any malicious program from automatically starting. All of the protection shields help Webroot have excellent malware protection equivalent to the latest versions of Norton and Panda. The Internet Security and the Antivirus with Spy Sweeper versions include a full blown versions of the companies Antispyware â€œSpy Sweeperâ€ software. The spy sweeper stand alone software has essentially the highest anti spyware detection rates in the industry. Several fortune 500 companies utilize Spy Sweeper to secure their corporate networks. 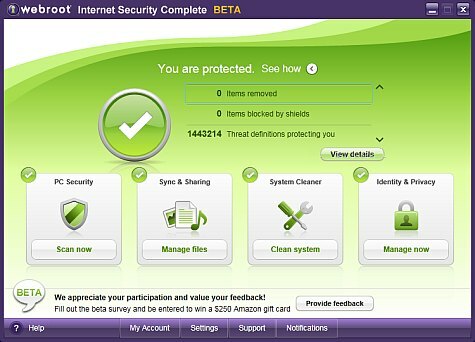 The biggest advantage to Webroot Internet Security 2011, is its interface. The interface is beautiful and incredibly easy to user. The interface also includes helpful tutorial videos that can guide a user through all of the features of the product. While Webroot Internet Security 2011 may offer excellent security, it doesnâ€™t detract from the fact that Webroots software has been known to uses a lot of computer resources. Therefore, it is recommended to run the antivirus software on at least a machines with a dual core processor and 2 gigabytes of RAM to avoid slowdowns.